Leonard Bernstein (August 25, 1918 – October 14, 1990) was an American composer and conductor who was among the first conductors born and educated in the US to receive worldwide acclaim. According to music critic Donal Henahan, he was "one of the most prodigiously talented and successful musicians in American history." 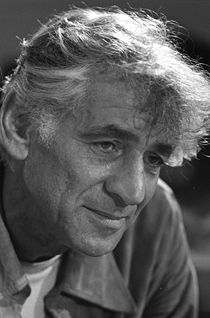 The prodigiously gifted American conductor, composer, pianist, and teacher, Leonard (actually, Louis) Bernstein (1918-1990), took piano lessons as a boy and attended the Garrison and Boston Latin Schools. At Harvard University, he studied with Walter Piston, Edward Burlingame-Hill, and A. Tillman Merritt, among others. Before graduating in 1939, he made an unofficial conducting debut with his own incidental music to The Birds, and directed and performed in Marc Blitstein's The Cradle Will Rock. Then at the Curtis Institute of Music in Philadelphia, he studied piano with Isabella Vengerova, conducting with Fritz Reiner, and orchestration with Randall Thompson. In 1940, he studied at the Boston Symphony Orchestra's newly created summer institute, Tanglewood, with the orchestra's conductor, Serge Koussevitzky. Bernstein later became Serge Koussevitzky's conducting assistant. Leonard Bernstein was appointed to his first permanent conducting post in 1943, as Assistant Conductor of the New York Philharmonic Orchestra. In November 1943, he substituted on a few hours notice for the ailing Bruno Walter at a Carnegie Hall concert, which was broadcast nationally on radio, receiving critical acclaim. Soon orchestras worldwide sought him out as a guest conductor. In 1945 he was appointed Music Director of the New York City Symphony Orchestra, a post he held until 1947. After Serge Koussevitzky died in 1951, Bernstein headed the orchestral and conducting departments at Tanglewood, teaching there for many years. In 1951 he married the Chilean actress and pianist, Felicia Montealegre. He was also visiting music professor, and head of the Creative Arts Festivals at Brandeis University in the early 1950’s. In 1956 Leonard Bernstein was engaged as associate conductor of the New York Philharmonic orchestra with Dimitri Mitropoulos, and became his successor as Music Director of the New York Philharmonic in 1958. From then until 1969 he led more concerts with the orchestra than any previous conductor. He subsequently held the lifetime title of Laureate Conductor, making frequent guest appearances with the orchestra. More than half of Bernstein's 400-plus recordings were made with the New York Philharmonic. Leonard Bernstein was a leading advocate of American composers, particularly Aaron Copland. The two remained close friends for life. As a young pianist, Bernstein performed Copland's Piano Variations so often he considered the composition his trademark. Bernstein programmed and recorded nearly all of the Copland orchestral works - many of them twice. He devoted several televised "Young People's Concerts" to Copland, and gave the premiere of Copland's Connotations, commissioned for the opening of Philharmonic Hall (now Avery Fisher Hall) at Lincoln Center in 1962. While Bernstein's conducting repertoire encompassed the standard literature, he may be best remembered for his performances and recordings of Haydn, Beethoven, Johannes Brahms, Schumann, Sibelius and Gustav Mahler. Particularly notable were his performances of the G. Mahler symphonies with the New York Philharmonic in the 1960’s, sparking a renewed interest in the works of G. Mahler. Inspired by his Jewish heritage, Leonard Bernstein completed his first large-scale work: Symphony No. 1: Jeremiah. (1943). The piece was first performed with the Pittsburgh Symphony Orchestra in 1944, conducted by the composer, and received the New York Music Critics' Award. Koussevitzky premiered Bernstein's Symphony No. 2: The Age of Anxiety with the Boston Symphony Orchestra, Bernstein as piano soloist. His Symphony No. 3: Kaddish, composed in 1963, was premiered by the Israel Philharmonic Orchestra. Kaddish is dedicated "To the Beloved Memory of John F. Kennedy." He also wrote many other compositions for various combinations, including orchesral, choral, chamber and piano works, song cycles, operas, scores for movies, music for ballett, incidental music for plays, musicals, and more. Festivals of Bernstein's music have been produced throughout the world. In 1978 the Israel Philharmonic Orchestra sponsored a festival commemorating his years of dedication to Israel. The Israel Philharmonic Orchestra also bestowed on him the lifetime title of Laureate Conductor in 1988. In 1986 the London Symphony Orchestra and the Barbican Centre produced a Bernstein Festival. The London Symphony Orchestra in 1987 named him Honorary President. In 1989 the city of Bonn presented a Beethoven/Bernstein Festival. In 1985 the National Academy of Recording Arts and Sciences honored Leonard Bernstein with the Lifetime Achievement Grammy Award. He won eleven Emmy Awards in his career. His televised concert and lecture series started with the "Omnibus" program in 1954, followed by the extraordinary "Young People's Concerts with the New York Philharmonic," in 1958 that extended over fourteen seasons. Among his many appearances on the PBS series "Great Performances" was the eleven-part acclaimed "Bernstein's Beethoven." In 1989, Bernstein and others commemorated the 1939 invasion of Poland in a worldwide telecast from Warsaw. Leonard Bernstein's writings were published in four books. He gave six lectures at Harvard University in 1972-1973 as the Charles Eliot Norton Professor of Poetry. These lectures were subsequently published and televised as "The Unanswered Question." Leonard Bernstein always rejoiced in opportunities to teach young musicians. His master-classes at Tanglewood were famous. He was instrumental in founding the Los Angeles Philharmonic Institute in 1982. He helped create a world class training orchestra at the Schleswig Holstein Music Festival. He founded the Pacific Music Festival in Sapporo, Japan. Modeled after Tanglewood, this international festival was the first of its kind in Asia and continues to this day. Leonard Bernstein received many honors. He was elected in 1981 to the American Academy of Arts and Letters, which gave him a Gold Medal. The National Fellowship Award in 1985 applauded his life-long support of humanitarian causes. He received the MacDowell Colony's Gold Medal; medals from the Beethoven Society and the Mahler Gesellschaft; the Handel Medallion, New York City's highest honor for the arts; a Tony award (1969) for Distinguished Achievement in the Theater; and dozens of honorary degrees and awards from colleges and universities. He was presented ceremonial keys to the cities of Oslo, Vienna, Bersheeva and the village of Bernstein, Austria, among others. National honors came from Italy, Israel, Mexico, Denmark, Germany (the Great Merit Cross), and France (Chevalier, Officer and Commandeur of the Legion d'Honneur). He received the Kennedy Center Honors in 1980. World peace was a particular concern of Leonard Bernstein. Speaking at Johns Hopkins University in 1980 and theCathedral of St. John the Divine in New York in 1983, he described his vision of global harmony. His "Journey for Peace" tour to Athens and Hiroshima with the European Community Orchestra in 1985, commemorated the 40th anniversary of the atom bomb. In December 1989, Bernstein conducted the historic "Berlin Celebration Concerts" on both sides of the Berlin Wall, as it was being dismantled. The concerts were unprecedented gestures of cooperation, the musicians representing the former East Germany, West Germany, and the four powers that had partitioned Berlin after World War II. Leonard Bernstein supported Amnesty International from its inception. To benefit the effort in 1987, he established the Felicia Montealegre Fund in memory of his wife who died in 1978. In 1990, Leonard Bernstein received the Praemium Imperiale, an international prize created in 1988 by the Japan Arts Association and awarded for lifetime achievement in the arts. Bernstein used the $100,000 prize to establish The Bernstein Education Through the Arts (BETA) Fund, Inc. before his death. Click here to see all items related to Bernstein.